Murgas members in the media spotlight! The Murgas ARC normally meets monthly on the first Wednesday of the month at 8:00pm. at the Luzerne County Emergency Management Building 185 Water Street, Wilkes-Barre, PA 18711 Guests are always welcome. The meeting usually features an informative program on a radio related topic after a brief business meeting. Please check the current issue of the MARC Times and our Yahoo group and Facebook pages for updated meeting information. Get a map to the meeting here. The Murgas Amateur Radio Club is an ARRL Special Service Club. The Club participates in several operating events during the year and members provide communications support for several local non -profit organizations. Our members are always ready to provide emergency communications in conjunction with the Luzerne County Emergency Management Agency. Many members hold ARRL appointments involving emergency communications. "Contest Contest DE K3YTL - Kilowatt Three Yellow Traffic Light calling!" You will also hear K3YTL on the air during Field Day and during the Pennsylvania QSO Party in October. The Murgas Amateur Radio Club has won the trophy for highest scoring club in the PA QSO party several times! "QRZ?" Our club members are active in the June and September VHF contests, most DX, stateside and digital contests. Several Murgas members also did well in the 2014 ARRL Centennial Challenge. The club also has an active ARRL VE Team, Exams are scheduled and announced as the VE team sees a need. An exam session is also held at our Hamfest in early July. The club repeater, K3YTL on 145.450 (TX-) (PL 82.5 ) covers the Wyoming Valley and surrounding areas. The weekly Murgas Net meets every Thursday night ot 9:00PM local on '45. A "Swap and Shop" session follows the net. The Club sponsors a network of APRS Digipeaters in Northeastern Pennsylvania using the call W3NEP and K3JML. These Digis were established by Mike Navin N3FJA (SK). The Murgas ARC is proud to sponsor a yearly scholarship awarded to an college student/amateur. The scholarship is administered by The Foundation for Amateur Radio (FAR). The MARC Times, our monthly newsletter is edited by Ron Hillman, N3KGC and published by George Wiencek, KB3QI. Articles for publication may be submitted to the club's mailing address or to Ron via e-mail. The trustee of our Club license and Net Manager is George Miklosi K3ZK. Our Volunteer Examination Coordinator is Rick Rinehimer, K3TOW. Our QSL Manager is John Denisco K3DBG. Club historian is Elaine Kollar, K3VQR. Club Webmaster and Public Information Officer is Rick Rinehimer, K3TOW. Club Technical Specialist is George Gannis, WB3FKQ. Murgas ARC "Ham of the Year"
Every year the members of the club nominate a fellow member for "Ham of the Year". The nominations are then debated by officers and the Board of Directors at the November BOD Meeting. The award is presented at the Murgas Holiday Dinner in December. Follow the link for a list of past "Ham of the Year" Honorees. The Club is named after Father Joseph (Josef) Murgas, a Slovak priest who was an early communications pioneer. His first experimental broadcast from Wilkes-Barre to Scranton, Pennsylvania took place on April 27, 1905. 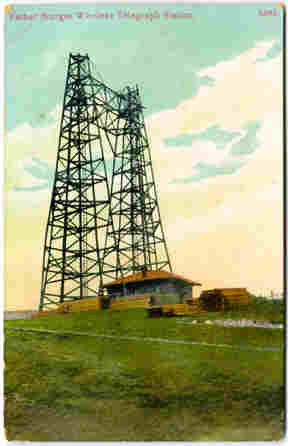 Although others had previously succeeded in transmitting over water, Murgas was first to successfully transmit over land. Murgas also developed a tone system for use in radio transmission. Father Murgas' transmitting towers in Wilkes-Barre are pictured on our club's QSL Card as well as the cards of several of our members. Father Murgas' accomplishments have been recognized by The Pennsylvania General Assembly in 1987 House Resolution 25. 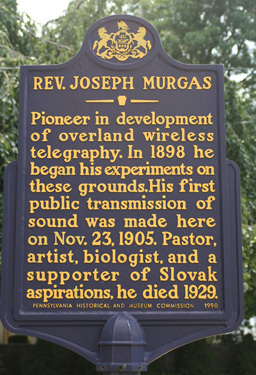 Was Josef Murgas the "Father of Radio"? Check these links and decide for yourself. 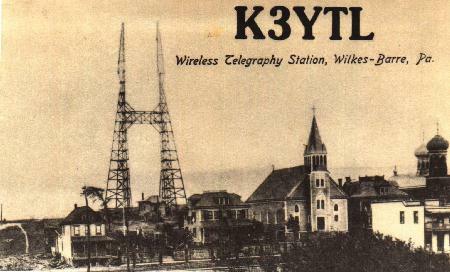 The callsign K3YTL was originally issued to founding member J. Campbell Collins. In 2006, the Club added in memoriam, the call of one of our groups founding members - Carl Kollar, K3JML to honor his years of dedication and service to the Club. Plans are to use this call for contesting and special event stations. Our members are very active in the hobby with such diverse interests as Contesting, DX, Amateur Satellites, EME, Amateur Television, Weak Signal VHF/Microwave, QRP, Local Repeaters, Packet Radio, Amateur Radio Emergency Service, Traffic Nets, and much more. Click on the QSL Card to e-mail The Murgas ARC Yahoo! group.